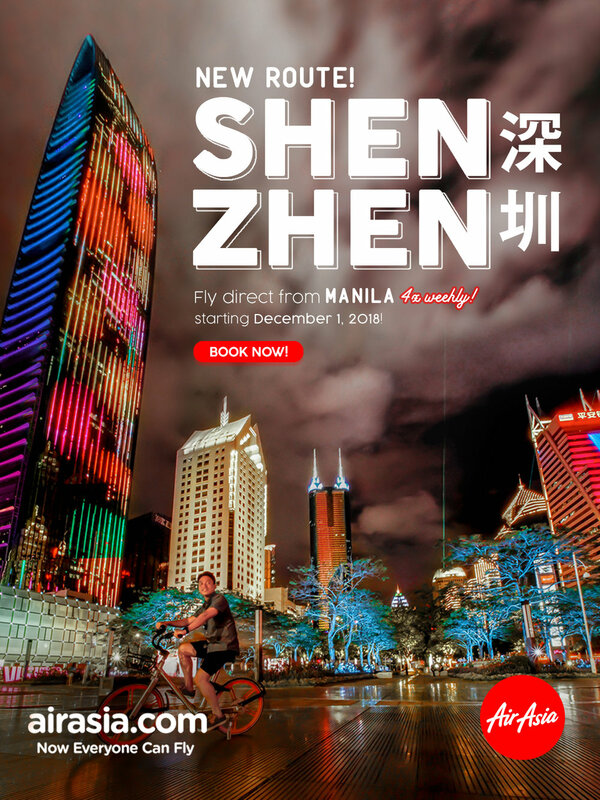 MANILA, 22 October 2018 – AirAsia, the World’s Best Low Cost Carrier, is expanding further into China with the introduction of its latest direct flights between Manila and Shenzhen starting 1 December 2018. Shenzhen is located in the Pearl River Delta (PRD) metropolitan area and is one of the major economic hubs of China. Known as “China’s Silicon Valley”, this place is home to some of the top startup and tech businesses in the world including the headquarters of popular global companies such as Huawei, BYD and ZTE. Manila – Shenzhen will be AirAsia’s second direct flight to the southern city that links Hong Kong to mainland China following the launch of Cebu – Shenzhen in April. “China is an important market for us and we are looking to expand our network further and connect Filipino travelers to new and exciting business and leisure cities,” Comendador added. To celebrate the announcement, AirAsia is offering all-in promo fares from as low as P1,990* one- way and now available for booking today until 28 October 2018 at airasia.com and valid for travel between 1 December and 30 March 2019. Keep updated with AirAsia’s latest promotion and activities via Twitter and Instagram (@AirAsiaFilipino) and Facebook (facebook.com/AirAsiaPH). *Terms and conditions apply, all-in promo fares for BIG members only.